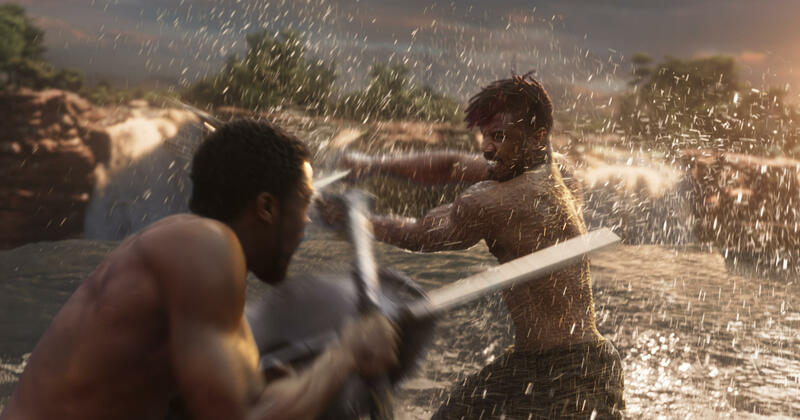 Black Panther (Chadwick Boseman), left, and Erik Killmonger (Michael B. Jordan) battle it out in a fight fueled by dueling visions of resource management. Academics can't stop talking about Black Panther. Sure, it's just a movie. A superhero action movie. But it's also a movie about an (admittedly fictional) African nation that, in the absence of colonialists, shaped itself through careful governance into a thriving society. And so on Twitter, in newspapers and just about anywhere you look, researchers, professors and African leading lights are talking about Wakanda. "No one wants to get roped into this discussion, but it's so hard not to!" Chris W.J. Roberts, a political science instructor at the University of Calgary, tweeted, before diving into a defense of the Wakandan government. Like many sub-Saharan African countries, the fictional landlocked nation of Wakanda sits on a valuable natural resource. In Wakanda's case, it's vibranium – an alien ore that absorbs sound waves and kinetic energy, making it virtually indestructible. Wakandans have figured out how to release the absorbed energy, allowing them to develop the most advanced weapons and technology in the world. Recognizing that others might try to exploit the country for the rare and powerful resource, generations of kings – known as Black Panthers – have developed a protective strategy. The country is hidden behind a hologram, so to the outside world, Wakanda appears to be an impoverished nation. It also maintains a long-standing policy of isolationism and non-interference. Despite the government's secrecy and hands-off approach, real-world commentators describe Wakanda as a utopia because of its stability, innovation, prosperity and gender equality. "It's a reflection of what we would want our societies and countries to look like [on the African continent]," says Stellah Wairimu Bosire, CEO of the Kenya Medical Association, chairman of the National Gay, Lesbian Human Rights Commission of Kenya and vice-chair of the HIV/AIDS Tribunal of Kenya. The plot picks up when T'Challa (Chadwick Boseman) wins the ritual combat to succeed his father as the next Black Panther. But his ancestors' stable legacy is compromised when an American, who goes by "Killmonger" (Michael B. Jordan) challenges T'Challa for the throne. Killmonger believes Wakanda has a moral obligation to equip oppressed people of African descent around the world with vibranium to help them overthrow their oppressors — violently. Violent interference goes against everything the Wakandans believe in. But T'Challa's struggle against Killmonger eventually convinces him that Wakanda should engage with the rest of the world by contributing its resources. His goal is to reduce racial inequalities in places like the U.S. The scenario has made some wonkish international development experts wonder: Is aid really the most effective way for Wakanda to promote equality in other countries? Are foreign direct investments better? What about trade? Or migration? One of the pivotal questions being raised in these debates is about the so-called "resource curse" — the paradox that countries rich with natural resources tend to have slower economic growth, less stable governments, and worse development outcomes. That's because in the real world, unlike in the movie, countries with such resources usually end up using them to enrich the elites rather than to finance public services like education and health care. The enlightened attitude of Wakanda does have a real-world parallel. John Robert Subrick, an associate professor of economics at James Madison University, published a 26-page paper on the political economy of Wakanda, comparing it to Botswana — an actual landlocked sub-Saharan African country with rich natural resources and "bad neighbors" that managed to become one of the world's fastest growing economies after independence. Other writers drew lessons from the movie for managing natural resources, like the Democratic Republic of Congo's supply of cobalt. But almost all of the takes landed on a single point — the importance of good governance. Although Wakanda is not democratic like Botswana, Subrick says both the fictional and real nations bear the marks of wise and selfless leadership. Unfortunately, neither the movie nor the academic debate has settled the question: How do you create and sustain good governance? There is a theory that some of the Western institutions introduced in Africa — education systems, political systems, health-care systems — are beneficial. But no one is a fan of colonialism. Wairimu Bosire instead posits that when T'Challa opened Wakanda to the rest of the world, he strengthened transparency and accountability, which perpetuates good governance. "He says, 'We have this [resource]. Can we share? Can all of us have a piece of it? I'm not keeping it for my lineage,'" she reflects. For Wairimu Bosire, this shift in Wakandan policy is encapsulated in a memorable scene at the end of the film, when T'Challa lands his vibranium-powered jet on a basketball court in Oakland, California, where Killmonger's story began. He smiles as kids run up and explore the drone-like ship, and he tells his young scientist sister Shuri (Letitia Wright) that she will be leading a Wakandan outreach program in the city. But in an op-ed for the Washington Post, Kenyan political commentator Patrick Gathara challenges the notion that Wakanda is an ideal at all. He argues that the story is a neocolonial vision of Africa dreamed up by the West — one in which Africans, despite all their technological advances "have no thinkers to develop systems of transitioning rulership that do not involve lethal combat or coup d'etat." To that, Ugandan aid critic Teddy Ruge tweeted, "Ugh...the mind pieces on Wakanda. Can we apply this same energy to fixing real life problems right here in black culture and African development? Clearly we have the mental aptitude."